Just Sign In or Sign Up on Yatra.com and earn free Rs. 100 eCash. 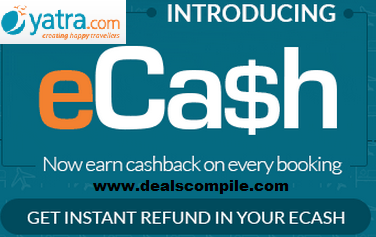 Yatra eCash is a quick and easy way to manage your booking refund and cashback with Yatra.com. Now you will earn cashback on every booking made with us. The next time you cancel a booking, transfer your refund amount to your eCash account. Once you have money in your eCash account, select eCash on the checkout page and use it to make quick and hassle free booking with Yatra.com!